Paterson and the Poetry of Everyday. I just had the pleasure of watching Paterson, a movie that centers its plot around the daily life of a man called Paterson, who also happens to live in Paterson. When I say “daily life”, I really do mean daily life. Not only is the movie made up entirely of 7 days of his life, nothing truly dramatic happens. Throughout the movie, I kept having this expectation of something dramatic that’s about to unfold, something that’s worthy of an American (which, perhaps unfortunately, often approximates to Hollywood) movie. Could it be his wife, played by the lovely Golshifteh Farahani, going bonkers from her apparent obsession with blacks and whites? Or could it be Paterson running into a traffic accident, killing most of his passengers and causing distraught to his wife? Could the phenomenon of twins be an omen of something drastic that’s about to happen, somewhat related to twins? Admirably, director Jim Jamusch refuses to bulge from his position (or what I think is his position) of simply examining life as it is, of an apparently average person leading a less than dramatic life, filled with the poetry of every single day. Eventually, I came to accept the fact that no one is going to turn into a world-saving superhero, and no disaster is going to blow the city of Paterson apart. Not only did I begin to see the beautiful ordinariness of Paterson’s everyday life, but by the end of the movie, I feel like I could watch the life of Paterson forever, just like the way the audience in Truman were captivated by the daily life of an unknowing actor. This reminds me of the experience I had when I first watched The Umbrellas of Cherbourg, during which the director challenged me to see musicals in a new light. Similarly, with Paterson, I enjoyed the way I was made to accept movies as a form of documentary, one that’s devoid of artificial drama, and which celebrates the beauty of everyday life. For most of us who are not changing the world or who aren’t suffering directly from disasters and wars, life can sometimes seem like it lacks a certain flair. But Paterson has shown me and its audience that our ordinary life is in and of itself a form of poetry, a thing of beauty. For that alone, the movie is worth a watch, even if it may not end up being a landmark in the history of cinema. As a final note, I think the way Wikipedia describes Paterson (played convincingly by Adam Driver) is somewhat off the mark. The way I see it, Paterson is in no way “an aspiring poet”. Here’s a bus driver who happens to enjoy writing poetry and who is too shy to show his work to anyone but his wife. I don’t see Paterson going from publishers to publishers to get his works published so he can become a “real” poet. 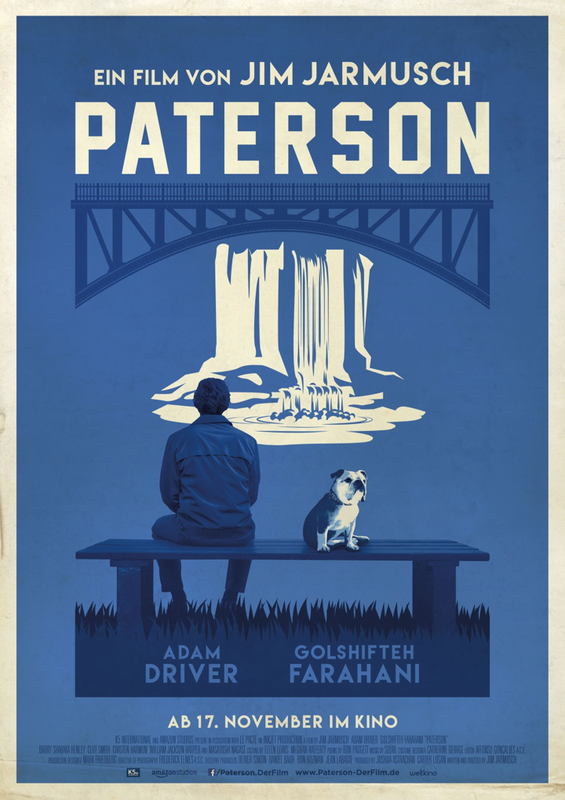 Just as the movie is contented with the poetry of everyday life, so is Paterson probably contented with his life as it is. Though of course, whether or not he earns his living through poems, Paterson is already a poet.